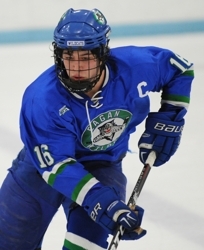 Most of Eagan’s top players are juniors. Michael Zajac, Will Merchant, Eli May, Sam Wolfe, the Kuchera brothers (Nick and Derick) . . . This isn’t an inexperienced bunch, but it isn’t a veteran crew, either. The Wildacts are stuck in a sort of development limbo between raw and refined. And their results show it. Eagan coach Mike Taylor watched his team surrender a 3-0 first-period lead in an eventual 3-3 tie with South Suburban Conference rival Apple Valley on Saturday, Feb. 5. Taylor could only hope his Wildcats learned something about sustained intensity, avoiding letdowns and all the other catchphrases associated with playing hard the whole game. “We played to the scoreboard, and that’s always trouble,” Taylor said about a second period that was dominated by the Eagles, partially because they had three power-play opportunities compared to one for the Wildcats. “I think we took penalties because we were lazy. And I don’t know how else to say it. Again in the third and in overtime we didn’t take penalties because we skated. Eagan is 14-5-2 and hanging on to No. 10 in the latest Class 2A state rankings. The Wildcats have a resume win over Eden Prairie and a one-goal loss to Edina this season. They have defeated and tied Apple Valley, the team that figures to give the Wildcats the toughest competition in the Section 3AA playoffs. Last season, Apple Valley bounced Eagan out of the playoffs. The Wildcats had won both regular season meetings. “I think it shows that if one team doesn’t show up to play, the other team can drill ’em,” Taylor said about the most recent meeting with Apple Valley. “You’ve got to be focused when you play them. The rest of the top 10 in Class 2A remained mostly the same, with Hill-Murray holding at No. 1 and the usual up-and-down shuffling in what has been a rare season for its unpredictability. In Class 1A, St. Thomas Academy remains at No. 1 and on Tuesday will face Rochester Lourdes, which soared from a tie at No. 9 all the way to No. 4 this week. All of the Pioneers' forwards are scoring at a steady clip, goaltender Tim Shaughnessy has been a picture of consistency and the defensive corps hits hard and moves the puck crisply out of the zone. In other words, Hill-Murray doesn't have a lot of weaknesses. The Pioneers' schedule gets a bit tougher this week with games against strong North St. Paul and South St. Paul teams. The Red Knights made the long trek to Moorhead and dismantled the Spuds 6-1. That might have been Benilde-St. Margaret's most impressive win of the season, although the Red Knights did beat Hill-Murray 3-1 back on Dec. 4. Defensive pairing of Jake Horton (34 points) and Patrick Daly (33 points) ranks among the state's best. The Skippers, who have won nine of their last 10, are led by sophomores Vinni Lettieri and Max Coatta with 14 goals each. Junior Erik Baskin also has 14 goals, including nine in his last six games. Yes, the future looks promising for Minnetonka, especially when you consider that the Skippers' junior varsity was unbeaten (19-0-1) through Monday, Jan 7. The Eagles have five losses, which, most seasons, would be an alarming total for a team this talented. This season? All of the state's top teams haven taken turns beating up on each other in a merry-go-round series of unpredictable -- and highly entertaining -- matchups. Lake Conference schedule includes two more behomoths this week in Wayzata and Minnetonka. The Trojans rely heavily on the scoring of top forwards Tony Cameranesi, Mario Lucia and Tyler Klein, each of whom have 14 or more goals. Too heavily? No other Wayzata forward has more than five goals. Defensemen D.J. Jones (4 goals, 22 assists) and Marc Richards (7 goals, 17 assists) are terrific offensive threats. The Crimson stretched their unbeaten streak to 11 games last week, are the runaway leaders in the Northwest Suburban Conference race and the prohibitive favorite to get the top seed in the Section 5AA playoffs. An amazingly sound defensive team, Maple Grove hasn't allowed more than two goals since a 6-0 loss to Eden Prairie on Dec. 29, a stretch of 11 games. The Blaze have been virtually untouchable in the topsy-turvy South Suburban Conference, although they did need overtime to get past Prior Lake on Saturday, Feb. 5, in a surprisingly close game. Burnsville is 13-0-1 in conference play, while no other team has fewer than three losses. The Hornets alternated a big win (3-0 over Eden Prairie) with a tough loss (2-1 to Wayzata) last week, which has been typical of their up-and-down season. Edina has not had a win streak longer than three games, and the defending state Class 2A champion Hornets suffered a three-game losing skid in late January. Surprising loss to Blaine on Saturday almost knocked the Greyhounds out of the top 10. Duluth East, which at one point this season was pushing toward the state's No. 1 ranking, has alternated wins and losses in its last four games and is 3-3-0 in its last six. Production from top line of Trevor Olson, Jake Randolph and Dom Toninato has slowed from torrid early season pace. The Wildcats have had some impressive wins (over Eden Prairie and Apple Valley) but also have had some confounding losses (to Bloomington Jefferson and Lakeville North). Eagan tied and lost by a goal to Burnsville, and also lost by a goal to Edina. All of which proves this is a team that can beat, or be beaten by, the state's best on any given night. Honorable mention: Grand Rapids, Apple Valley, Bemidji, Blaine. The Cadets are on a four-game win streak that includes shutout triumphs over top 10 Class 1A teams Totino-Grace and (6-0) and South St. Paul (5-0). St. Thomas Academy has two other wins over top 10 small-school teams (Duluth Marshall and Breck) and four of its losses have come against top-10 big-school opponents. The other loss came against Shattuck-St. Mary's. After losing just once in their first 19 games, the Hawks suffered back-to-back losses to Eden Prairie and Cloquet last week, then slipped past Monticello 2-1. Did Hermantown peak to soon? Doubtful. Injuries to some top-line forwards have forced line juggling, but the Hawks have too much firepower and too solid of a defensive corps to be dismissed as anything but a state Class 1A championship contender. The Bears' body of work just keeps getting better and better, as they stretched their win streak to seven games with two more victories -- both by shutout -- last week. Blake's two losses both came against big-school teams (Holy Angels and Minnetonka) with state tournament aspirations. The Eagles are coming off an impressive 5-3 win over two-time defending state Class 1A champion Breck on Saturday. Rochester Lourdes scored the first four goals before holding off a Mustangs comeback attempt. Lourdes takes another shot at a Twin Cities private-school power when it plays No. 1 St. Thomas Academy on Tuesday. The Eagles' 6-0 loss to St. Thomas Academy took a little of the shine off what has been an outstanding season. That setback was particularly painful, given that Totino-Grace is considered one of the teams that could challenge the Cadets in the Section 4A tournament. Breck's loss to Rochester Lourdes puts the Mustangs at 0-4-0 against top 10 Class 1A teams. Breck doesn't face another top-ranked opponent until it closes the season on Feb. 19 with monster matchup against Tri Metro Conference and Section 2A rival Blake. The Warriors have had their ups and downs this season but appear to be peaking at the right time with consecutive wins over Duluth Central, Roseau and East Grand Forks. Junior goaltender Andy Foster quielty has assembled a solid season (2.11 goals-against average, .913 save percentage). Other than their two losses to both North St. Paul and No. 1-ranked St. Thomas Academy, the Packers have lost only to Class 2A opponents. Senior Adam Barlow doesn't get a lot of attention, but he should. The offensively gifted defenseman has scored 13 goals to share the team lead and also has 18 assists and a team-best plus/minus ranking of plus-24. The Hilltoppers have been in and out and in and out... and now back in the top 10 all season. That says more about the quality of Duluth Marshall's schedule then it does about their play, although some defensive inconsistencies earlier in the season now seem to be hammered out. The Hilltoppers have allowed more than two goals just once in their last eight games. More and more, it appears Section 8A will come down to yet another meeting between the Thief River Falls and rival Warroad. Micah Ranum leads a balanced offense with 18 goals and 20 assists. Five other Prowlers have scored eight or more goals. Fun fact: Thief River Falls has allowed one goal in each of its last eight victories. Honorable mention: Virginia/Mountain Iron-Buhl, Little Falls, Duluth Central, Hibbing/Chisholm.